1. To start, tell us why you were in Philadelphia. I was there on a business trip, bringing a new site network online as a network engineer and overseeing the technical details (to make sure everything went smoothly). 2. What was your initial impression of the city? I found it to be industrial and blue collared, with a rich history. The people who live there are very proud of their city and the work they do every day. 3. Describe Philadelphia for us in three words. 4. So, the famous Philly Cheesesteak. Tell us about it! I made it my mission to try the best cheesesteaks in Philly. These are the "real deal" places, not the tourist traps that sell low-quality food. I went to two places in Northwest Philadelphia that the locals I met suggested: Chubby's Steaks and Dalessandro's Steaks and Hoagies. They were considered the best in town, and they happened to be next door to each other (which made it convenient)! 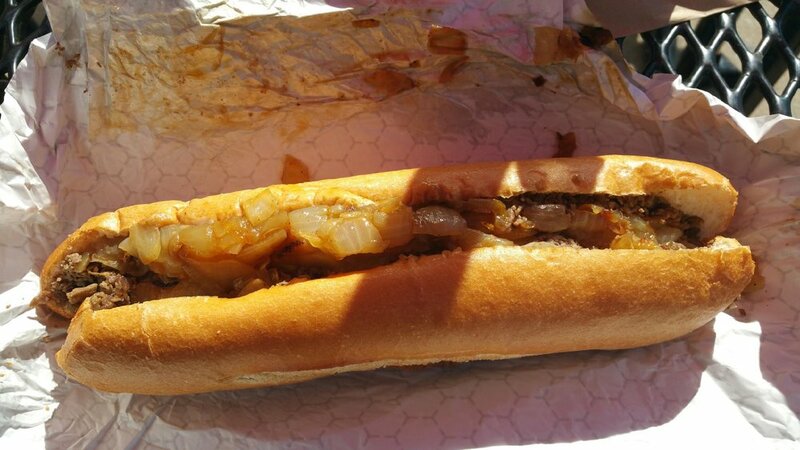 Photos (in descending order): Yummy, yummy cheesesteaks from Chubby's Steaks and Dalessandro's Steaks and Hoagies. After a back-to-back comparison of each (yes, I ate two cheesesteaks in one sitting), I determined Chubby's Steaks to be the best joint. The meat wasn't too granular or grainy (like Dalessandro's), and it was more juicy. Also, they had less of a rush, which made my time there more relaxing (Dalessandro's didn't have any open seats or standing room while I was there). If you visit either place, I recommend trying a cheesesteak the way the locals suggested it to me—with American cheese and fried onions. Delicious. One other thing: the bread makes the sandwich. You can get a Philly Cheesesteak anywhere else in the United States, sure, but it isn't made like it is in Philadelphia. It's rumored this is because the bread is made locally in Philly, and the water there is key to a perfect hoagie roll. 5. Is there anything you wanted to do that you didn't get to? I wanted to check out the Liberty Bell and explore the local areas more, but I didn't have much time to spend there outside of work. It was a short trip. By the time I got off site, it was dark, too. 6. What is it like to travel to a new city for work? It's great! I enjoy it. Traveling for work gives you the ability to visit new places, even in a short amount of time. It's always an adventure, and you get a fresh perspective on the world. 7. Is there anything you noticed about Philadelphia that spoke to you? I grew up in a blue collar family, near a grain elevator and train tracks, in a rural town in North Dakota. My neighbors all worked at the elevator—we all knew each other and were like family. Ever since I moved to the Twin Cities, I haven't felt that vibe. At least, not until I met the locals in Philadelphia. Somehow, it reminded me of my childhood, and it felt like I was home again. I guess that's why Philadelphia is called the City of Brotherly Love. 8. Given the choice, would you go back to Philadelphia? Why or why not? Yes, I definitely would, and for a longer stay next time. Philadelphia is very affordable, with good food, good people, and an interesting history that goes far deeper than its industrial roots and Philly Cheesesteaks.